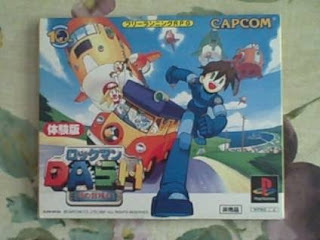 Congratulations on such a rare find, if I may ask a question, do you have any other equally rare Rockman items? Or is this particular beta without equal since there are so few copies? Yeah, I would say you got a good deal on that. I used to have all kinds of rare items and sold them all off in college....now I'm slowly re-buying them as I find them. Ooooh, nice. What's so special about the beta, though? :O Protodude actually ripping a disc?? XD Well, whatever the differences, they can't be THAT special. I'd like a MMNT beta disc... I still wants thems 3d boss battles!! Question: Hoe long is the beta? I mean if the story goes to the end? @Zx: The beta takes you all the way up to the fight with the Feldynaught. However, the game skips the "find gramps" sceneario. I forgot to tell you that I do have both versions of the game. The Capcom Friendly Club and the Biohazard 2 Trial editions. They're actually the same "demo" games, besides the title change. Yea, a YouTube "video tour" might be a wiser idea. I don't understand why anyone would keep something like this to themselves. It's totally selfish. Did Demi keep Earthbound Zero to himself once he got hold of a copy? No, after dumping the game he let everyone play it. Most people in the emulation scene still give him lots of credit for doing so (not that "getting credit" should matter anyway, because you don't own the rights to the game to begin with). Likewise, the guy who released the Chrono Trigger beta through Chrono Compendium is pretty well known too. Basically if you want to be vilified as that guy who was generous enough to allow other people to look at what they would love more than anything to play, but too selfish to allow them to play it, do so at your own risk. No one likes a beta ROM hoarder. I'm suggesting that it should be spread in a way so it's well-accepted by others. I'm not against the sharing, but there are some idiot hoarders around that wants to be annoying like that. It's something I'm gonna have to consider. Vixy does have a point and so does Anonymous 4. One thing I know for a fact is that a majority of those who want the beta intend to use it for experimental purposes. It's their wish to crack the game open and look for unseen oddities Capcom hid from consumers. This reason alone makes me feel like uploading the beta is worthwhile, regardless if I receive credit or not. I've waited eight long years to get a hold of this beta, and I too would be pretty ticked off if I knew some guy had the ability to distribute the ISO but chose not to out of selfishness. With that said, I'm considering distributing it. Maybe even for a limited time or for requests, I dunno.